The opening of “Three Lions ‘98” is a spot of justified bragging – the hopeful murmurs of the original replaced by a stadium in full cry: “It’s coming home, it’s coming home…”. In musical terms, Baddiel, Skinner and Broudie really had won the cup – a football song that had been taken up by fans as a genuine chant. It made a sequel – or rather, an update – understandably tempting. It’s an update that has to play slightly generous games with recent history, though. The original “Three Lions” mined glorious memories of three decades to fuel bittersweet, defiant belief. The new version has two years to work with, like a football song version of the ‘difficult second album’, and its brief is to send the lads and fans off to France on a high. So while the original had World Cup victory to draw on, “Three Lions ‘98” is ultimately a song hymning a 0-0 draw at the end of a qualifying campaign. A very important, hard-fought 0-0 draw, to be sure, but a definite narrowing of focus. Where the ’96 song climaxed with a wide-eyed, heartfelt plea, “I know that was then… but it could be again”, here in its spot we get, “We can dance Nobby’s dance / We can dance it in France”. The Muse here has failed to even make the bench. So while it might have been inevitable, “Three Lions ‘98” also shows why it was the last of its line (there is a 2010 version, but they barely updated the 1996 lyrics). Qualifying tournaments are not always easy for England, and they seem to end up needing a result in most final games, but by and large they get it. Mythologising one last-gasp qualification might work, but doing the same thing every two years? Nobody’s idea of fun. “Three Lions ‘98” stands alone as a trial at making a folk music concept – the perpetually refreshed song that changes to fit current events – work within pop. It didn’t, quite. That doesn’t make this particular go at it a terrible record. In fact, you could argue that “Three Lions ‘98” rings truer than its parent – getting the results you need the hard way is part of the scrappy beauty of football, and deserves to be at the heart of at least one song. But it might be the wrong song. “Three Lions” was exactly the right style and sentiment for its moment – not just a tournament in England, but the Britpop era too, just as it was becoming overripe. The track had a desperate hopefulness that was almost religious – an England win, in London, at this time of all times, would complete a spell, dispel the anxiety behind the brittle busywork of Cool Britannia, make it into something real. 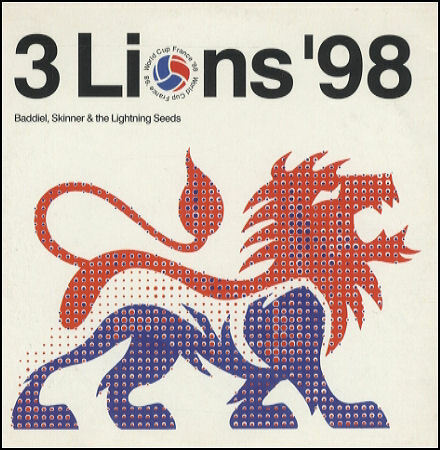 It was nearly complete… but the spell had been broken, and “Three Lions ‘98” is the same tune brought down to earth, stripped of its extra resonance and buoyancy in a world where Britpop had been punctured, and records like this no longer felt like a typical sound for English music. Two years might not have given Baddiel and Skinner much to work with in English football terms, but in pop, Summer ’96 already seemed a very long time ago. #59 – It is genuine commentary from Jonathan Pearce that opens this version. However, as he was a commentator for a rival station at the time, the top 40 on Radio 1 were playing a version of “3 Lions ’98” that substituted this for commentary from the BBC coverage of the same Euro 96 match – which wasn’t commercially available. The irony of all of this being that Jonathan Pearce subsequently joined the BBC as a commentator a few years later. #60 – I saw that this morning. Always one or two that take it too far. – We are due a reckoning with this song I think, since it now seems like it’s going to pass into something that will be brought up anytime the England team has any semblance of success in the future. My moaning up thread about the triumphalist nature of the 98 version, versus the hope over expectation underlying the original, is being writ large right now. It’s turning me off it something chronic. (Of course, it was always there in the original – Football’s Coming Home [remember, simply the slogan of the tournament because it was held in England, not an expectation England would win] – but there’s something about the attitude of those singing it that curdles the sentiment very quickly). – I bet, if the result goes England’s way tonight, that Baddiel and Skinner are going to be pressed for a third in the trilogy. They might even be prepping lyrics as we speak. I view this with cynicism and dread. They should be reminded that there’s very few ends to trilogies that are much good (Toy Story 3 I think, and that’s about it – plus Disney are going to balls that up by adding a 4th). – On the football, I’m still not saying England’ve turned the corner (the quality of opposition beaten to get this far is something of which I am sure we’re all aware) but for the first time in several years, I might actually be able to see a corner to turn, which is slightly breathtaking. Oh dear. If nothing else, Gareth Southgate has made me interested in football again (which I never thought possible) and has given the country something to feel positive about these last few weeks. Not to mention he has bought waistcoats back into fashion, so a win there. Interesting to note: last week “Shotbun” had 18,000 sales out of 76,000 combined sales; this week “Three Lions” has 43,000 sales out of 80,000 combined sales. I’m assuming this is a sign of an audience that skewed older and so bought instead of streaming; it might also be a result of it presumably being cheaper than a single released actually this year. …so after fifteen years, Popular has reached the current number one! …the number one at the time Popular started is still bunnied, mind. It’s curious as to how the discussion has found its way on to this entry when I suspect most people this week while have been downloading/ streaming the 1996 version. How’s this for a statistic? For four (non consecutive) weeks in 1996 the top three singles were fated to variously be number one across three different decades; Three Lions of course returning this week and a non bunny at the time (and still at this point of Popular) getting there in 2004. #66. Well done Lee Saunders. I think that was an interesting prediction. Relied upon an understanding of both a) how we live today and b) how the charts are compiled. As I say, well done. #59, #61: the BBC commentary on that night was Barry Davies’s iconic (to me at least) “Ohhh nooo!” which never seems to feature in discussions of the man’s greatest moments. This might be in part due to the curse of retrospective commentary, particularly prevalent on YouTube (“Will Steven Gerrard score a last minute free kick in front of the Kop? Steven Gerrard HAS scored a last minute free kick in front of the Kop!”). Basically I have to second guess whether all or any of my favourite soundbites from 1994-2004 were ever actually spoken!